SAN FRANCISCO -- A short sharp earthquake rattled the San Francisco Bay Area, but there are no reports of injuries. The U.S. Geological Survey said the 4.0 magnitude quake struck Monday morning and was centered just north of Piedmont, near Berkeley. It was felt in downtown San Francisco, along the Peninsula and in the East Bay. 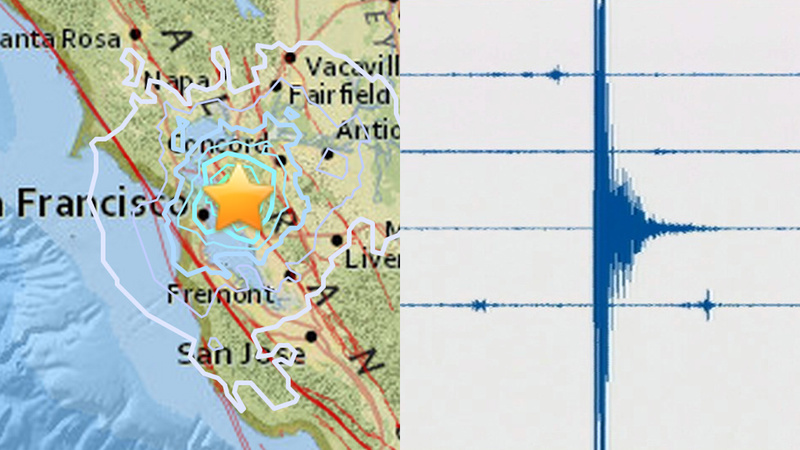 The quake struck on the Hayward Fault at a depth of about 3.4 miles, according to the USGS. The shallow quake at 6:49 a.m. was a sharp jolt, followed by a couple of gentle rolls. It was not immediately known if the quake caused damage. Bay Area Rapid Transit is holding trains to check the tracks on the public transit system. Commuters should expect delays. The 4.0 earthquake centered in Piedmont struck at 6:49 a.m. local time. The quake was felt far and wide around the Bay Area and several small aftershocks have been reported. #BREAKING: 4.0 #earthquake felt widely across Bay Area. http://t.co/CskSjCzfFO If you felt it or have pics of damage tag with #abc7now! The #earthquake in #Oakland sounded like explosion. It woke me up and my air bed was shaking badly. My 2 #dogs were so scared. #abc7now! #abc7now in Pinole, it felt like a strong jolt then a quick shake for about 3 seconds. Several small aftershocks have been reported following the earthquake that struck in Oakland Monday morning, according to the U.S. Geological Survey. The 4.0 quake was reported at 6:49 a.m. and was located in the Oakland hills about a mile north of Piedmont and 3 miles south of Berkeley, USGS officials said. The quake had a depth of about 3.3 miles and struck on the Hayward Fault, which also saw a 4.0-magnitude earthquake on July 21 in Fremont. Several small aftershocks were reported in the hour after this morning's quake, the biggest of which was a 2.4-magnitude temblor in the same area at 7:40 a.m., according to the USGS. BART stopped trains to inspect the tracks for possible damage. No damage was found, but major delays persist. The quake was reported across the Bay in San Francisco and on the Peninsula, as well as out in Concord and elsewhere in Contra Costa County. No major damage or injuries have been reported as a result of the quake.